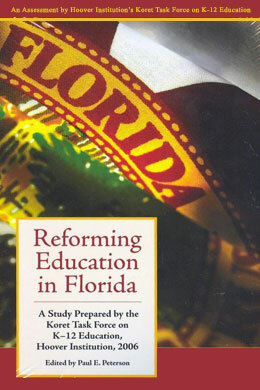 In 2006, at the invitation of Governor Jeb Bush, the Hoover Institution's Koret Task Force on K–12 Education agreed to undertake an objective assessment of Florida's education policies, focusing on the most pressing issues on the state's agenda—accountability, curriculum reform, effective teaching, school choice, and organizational change, including voluntary preschool education, class-size reduction, and more effective resource management. Florida has already established itself as a national leader with many of its education policies, but crucial challenges lie ahead. This timely and objective assessment by the Koret Task Force identifies the reforms that have been undertaken and provides important guidance for future decisions by the state's citizens and its leadership.